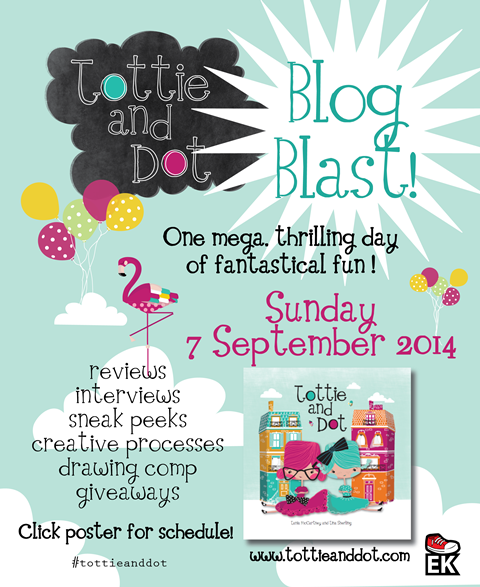 This review is part of the Blog Blast tour to celebrate the launch of Tottie and Dot. Click the image at the end of the review to see the list of websites taking part in the tour. Tottie and Dot are two little girls who live side by side. They love to do everything together. It Tottie has marshmallow tea, then Dot will have some too. If Dot has apricot sandwiches for lunch, Tottie will too. Side by side. So what happens when one of the girls does something a little bit different, a little bit bigger, than her friend? Will their friendship continue, or will they become rivals as they compete for the grandest, most elaborate house and most exciting, outlandish entertainment? Tottie and Dot captures beautifully that special aspect of friendship so often seen in the very young, where their lives are, as much as possible, a reflection of each other. They love the same colours, stories, foods, activities, songs and games. There is a special delight that comes from wearing the same outfit and accessories and having the same snacks packed into a lunchbox. Written by our own Tania McCartney, Tottie and Dot celebrates the pleasures, and frustrations, that come from this type of friendship. I can picture little girls giving this to their BFF for her birthday, and buying a copy for themselves too so that they can have the same book, which they can both read at bedtime on the same night. Illustrator Tina Snerling, who also worked with Tania on her An Aussie Year picture book (KBR review), has used a vibrant colour palette and wonderfully detailed illustrations to create Tottie and Dot’s world. Children will love spotting all the different items as the pages become more and more cluttered as Tottie and Dot attempt to outdo each other. 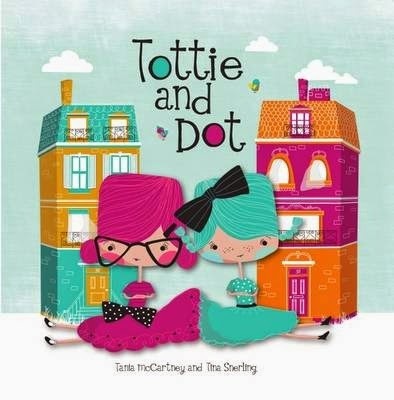 I think Tottie and Dot is a gorgeous book for young girls in preschool and early school years, sure to be read and re-read with great pleasure. That’s my opinion as the mother of a daughter and an experienced book reviewer. Real friendship is so often about ‘doing life’ with someone. Being by their side to laugh, cry and simply share everyday moments. This book is a celebration of that simple aspect of friendship. Sometimes we get caught up in the busyness of life, we get distracted and friends fade into the scenery of our life. Then one day, a book turns up at your door with a dedication that reads ‘To Susan – always by my side’ and the sun shines a little brighter (and I quite possibly shed an emotional tear or two). Tottie and Dot is a gorgeous story for little girls about friendship, a lovely book for young children to read and enjoy, and, for me, a very special reminder that I have wonderful friends, and one friend in particular, who make my life a little brighter because we get to share everyday pleasures, side by side. Gorgeous review, thank you KBR!